Nalikwanda constituency is not even a remote area. It is within Mongu district. But the state of ‘infrastructure’ there seems to be from 600 years ago. See in the pictures for what are called bridges. The entire community is subjected to crossing the crocodile infested streams to go to other areas access facilities. It is worse for school going children. 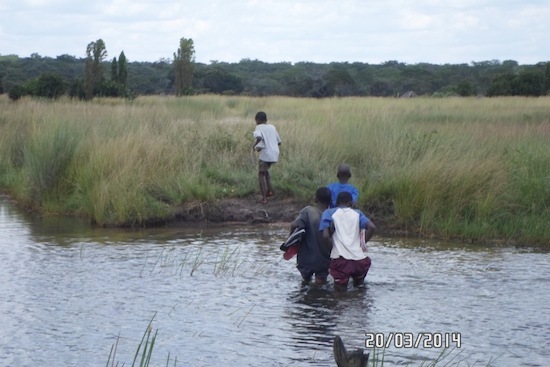 People of Siyowe area in Mongu district need to cross this stream everyday to access health services at Nasange health post. Pupils from the same area attend Namusheshe primary school located across the stream. It is a life-threatening journey to and from school everyday.Nasange Health post itself is nothing to write home about. It is just a ramshackle. We have a lot to celebrate Zambia’s 50th independence anniversary for?